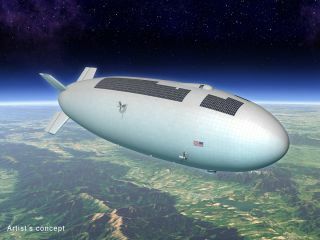 This artist's conception of a high-altitude airship is one of many possible models that could come from an airship design challenge. One of NASA's new citizen science endeavors could involve high-tech, record-breaking airships designed to aid scientific research projects. NASA has proposed a challenge that calls for airship designs that can fly higher and longer than existing airships. At the moment, no airship — blimp-like devices — can maintain an altitude of 65,000 feet (20 kilometers) for more than 8 hours. Weather balloons can soar to that height, but the balloons are difficult to control and vulnerable to winds. "You would be able to follow weather patterns, even get above a hurricane," Jason Rhodes, an astrophysicist at JPL who is leading the proposed challenge, said in a statement. "A satellite can't do that because its orbit can't be changed." The proposed challenge would include two tiers. The first tier would call for designs for an airship that can lift 44 pounds (20 kilograms) and hover at 65,000 ft. for at least 20 hours. The second tier designs would need to be a little more complex. Those airships would have to support 440 lbs (200 kg) at the same height but for at least 200 hours. Familiar blimps that hover around sports games are just one example of an airship. By definition an airship must be lighter than air and able to navigate through the air under its own power. NASA officials say there could be between $2 million and $3 million in prize money available for the competition. While studies have shown that there is significant interest in using airships for scientific experiments, airships could also have important industry applications. Telecommunication companies could use them to deliver wireless access to remote areas. Military personnel could use them for surveillance operations and missile defense warning. The proposed 20-20-20 Airship Challenge would become part of NASA's Centennial Challenges program that offers prizes to citizen-designed tech that solves research problems that are of interest to NASA. NASA will first gauge public interest in the airship competition before officially launching it.